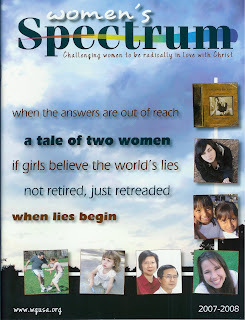 The 2007-2008 edition of “Women’s Spectrum” the official program magazine of the Women of Grace USA, is now complete and ready for shipping. The 46-page full color magazine contains a wide variety of feature articles, personality sketches, and challenges, including one by Women of Grace USA president Janet Minnix. Spotlighted missionaries for this year include Tracey Schwartz, Patty Morris, Siew-Choo Ong, and one other in central Asia. Other informative articles include “When the Answers are Out of Reach” by Jesi Kettering,”Called to Plant ‘Seed Truths'” by Lisa Triplehorn, “Not Retired–Just Retreaded” by Geneva Inman, “Why We Need Relationships for Personal Growth” by Dr. Christy Morr, “The Need for Prayer in Counseling” by Dr. Tammy Schultz, and much more. Linda Michael is senior editor of the magazine, and Viki Rife is the general editor. Single copies of “Women’s Spectrum” are available for $6 each or $5 each in quantities of five or more copies sent to one address. To order, or for more information, contact Women of Grace USA at PO Box 711, Winona Lake, Indiana 46590 or e-mail womenofgraceusa@aol.com. The Women of Grace website is www.wgusa.org.